Many years ago, in another life, while I was studying organic chemistry, my eyes often wandered to the colourful and complicated maps of biochemical pathways which often hung in lecture rooms and laboratories. I’m sorry to say that I paid them little attention, other than to reflect that I was lucky to have avoided the study of much biochemistry. As I became interested in later years in the representation of scientific information, I came to a vague realisation of how effective these maps were in conveying a great variety of complex concepts and relationships in a pleasing and relatively easily assimilated manner. I certainly did not realize how much they owed to one individual, Donald Nicholson, who died in May this year. His life and work is described in a obituary from Leeds University. Nicholson, for most of his life an academic in the department of microbiology at Leeds, developed his first maps in 1950s, trying to display the sequences of chemical reactions involved in metabolic processes which were being identified in increasing numbers, and continued his work for over 50 years. His charts are certainly among the earliest examples of what would now be called visualisation, and are among the best known graphical representations of scientific data. More than a million copies have been produced in 22 editions, now joined by a variety of smaller ‘minimaps’ and computerized ‘animaps’. Interestingly, they were first produced commercially by the same company responsible for Harry Beck’s London Underground map, an equivalent well-known and helpful diagram in a very different domain. 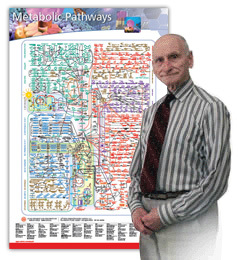 Full details of Nicholson’s work, with many examples of his maps, can be found on his website, mainlined by the International Union of Biochemistry and Molecular Biology. Even for those with no desire to learn more about biochemistry, they are well worth investigating as a classic, even iconic if you like the word, information product.